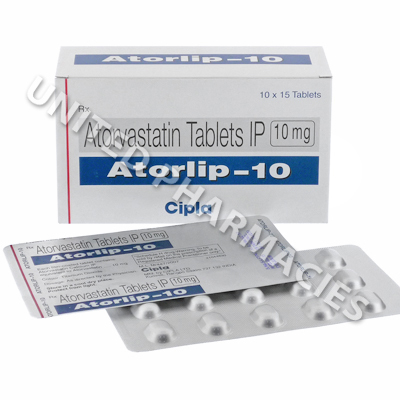 Atorlip (Atorvastatin Calcium) is a type of drug called a statin. It works by reducing the level of LDL (bad cholesterol) and triglycerides in the body, while at the same time increasing the quantity of HDL (good cholesterol). Atorlip (Atorvastatin Calcium) is a type of drug called a statin. It works by reducing the level of LDL (bad cholesterol) and triglycerides in the body, while at the same time increasing the quantity of HDL (good cholesterol). Patients undergoing treatment with this drug are normally told to undergo an exercise regime and diet plan in order to decrease the risk of a heart attack or stroke occurring. Treatment with this drug may also reduce the risk of requiring surgery in patients considered to be at risk from heart conditions. Atorlip (Atorvastatin Calcium) tablets should be taken by mouth. Your doctor will tell you the correct amount to take. Adult patients are sometimes told to take it once per day, and it may be taken either with food or without food. However, the dosage is usually based on various factors, such as the patient's age, medical history and response to treatment. In order for this drug to be effective, it is necessary to continue taking it if it has been prescribed to you. Do not stop taking it unless told to do so by your doctor. You should tell your doctor immediately if any of the above mentioned side effects persist or become more serious. There is also a slight chance of more severe side effects. Immediately see your doctor if you notice fever, severe fatigue, appetite loss, an increase in weight, changes in urination or any other side effects not listed here. This medication may harm an unborn baby. Because of this, patients should not take it when pregnant, and reliable contraception should be used while taking it. Ask your doctor for more details. Patients are advised not to drink grapefruit juice or eat grapefruit while taking this drug. Always use Atorlip (Atorvastatin Calcium) as you have been prescribed by your doctor. Never self-medicate or change your dosage without first consulting your doctor. The correct dosage can vary depending on your health, medical history, and the severity of the condition being treated.